Nobody has time, desire or attention span to sit through long, dense training programs. In a world of information-overload, learners want a short and sweet learning programs that give them the information and tools they need at the point of need. 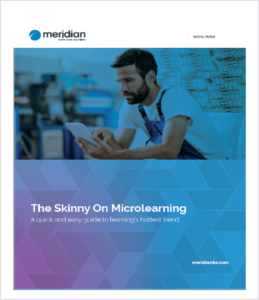 Out of that demand, microlearning was born! Microlearning offers learners what they’ve been begging for: Mini-lessons delivered in media-rich formats that cover a particular topic. The result? Learners walk away having learned something new and trainers no longer worry that they’ll soon forget the information.